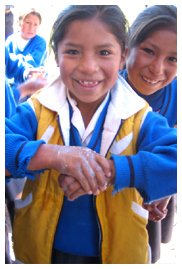 Global Handwashing Day partners in the UK produced a range of activities focused on raising public awareness and engaging school-aged children. The London School of Hygiene & Tropical Medicine released results of a study of contamination levels on commuters’ hands in five UK cities. The Health Protection Agency operated interactive handwashing promotion events in underprivileged areas of London. A poster competition gave children ages 6 – 11 the opportunity to think creatively about handwashing promotion for a unique prize trip to India to visit groundbreaking handwashing promotion programmes. Activities with policymakers included a media event with several Members of Parliament at the Houses of Parliament, and an Early Day Motion for the Government to support hygiene promotion.